Zozer Games is an online roleplaying game publisher based in Yorkshire, England. Paul Elliott, the developer, focusses on writing for the Traveller and Cepheus Engine roleplaying games, but also produces a number of stand-alone historical games. Paul Elliott has published books in print with several companies, including Blandford Press, Arms & Armour, History Press and Steve Jackson Games. He has also written articles for Ancient Warfare Magazine, Basic Action Games, Moon Toad Publishing, Skorched 'Urf Studios, Momento Mori and Mongoose Publishing. A gritty near future setting inspired by those late-70s and early 80's movies like Alien, Bladerunner and Outland. Realistic spacecraft, using reaction drives and rotating hab modules for gravity. Orbital is set in our own Solar System and has a real hard-science feel to it. A complete set of solo campaign systems that allow one player to have the fun, immersion and excitement of group play, without fuss or long, involved dice rolls. Designed for use with Cepheus Engine and other 2D6 SF games. Written under the Traveller licence, this solo add-on allows a single player to crew a ship, buy and sell cargoes and engage in exciting, dynamic and surprising adventures. A solitaire product. The Star Trader rules have also been adapted for Cepheus Engine and appear in that form in the SOLO book. Based on an incredibly popular 2D6 science fiction game developed in the late-1970s, through the 80s and 90s, Cepheus Engine uses Open Content sources to build a free access SF game of unparalleled utility and playability. This is due to the act that much of the material published over the past 35 years can still be used with Cepheus Engine. And new settings, vehicles, worlds and scenarios are being published in print and as PDFs every week. Cepheus Engine is the key to the door linking science fiction roleplaying adventures of the past with those of the future. The game was skilfully created from Open Content material by Jason Kemp of Samardan Press. True to the Open Content mission, he has released the game for free. That is three decades of science fiction, perfected by a generation of roleplayers, available to you without charge. That is astounding. And simply because it is free, does not mean that it is 'worthless'. The rules within are honed and tested, crafted and complete. 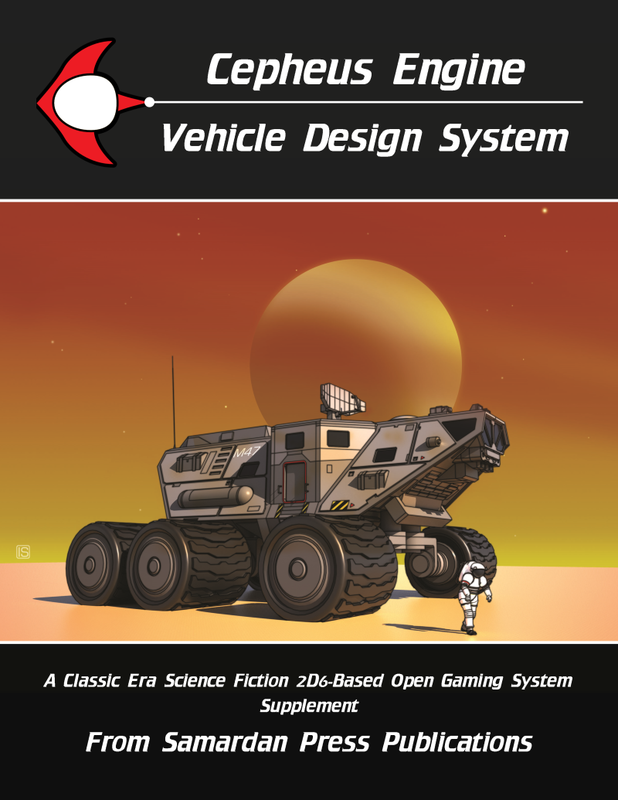 ​The Cepheus Engine Vehicle Design System is a paid product, available as a PDF download from DrivethruRPG. The Cepheus Engine Core Rules (beautifully formatted and laid out) are available either as a perfect bound softcover or a downloadable PDF. Zozer Games also produces other table-top roleplaying games and specializes in historical gaming. Some of the games, like Warlords of Alexander or Zenobia, are available free of charge. More recent games are available at DriveThruRPG in a PDF format or at Lulu Print on Demand as softback books. History is a speciality! A Roman horror RPG: face the full terror of ancient Britain as a Roman legionnary with your squad mates. With a fast play and bloody 2D6 combat system. Well illustrated and with many maps. A complete RPG that takes you into the Green Hell of Vietnam as an infantryman: a 'grunt'. You won't see the enemy, you probably won't see the booby traps ... and when the shooting begins, it might just be every man for himself. Dark. GURPS ATOMIC HORROR - Still Selling! Science Runs Amok in B-Movie Adventures! The RPG of classic 1950s horror featuring flying saucers, radioactive ants and everything in-between! A well-loved worldbook for Steve Jackson's popular RPG GURPS.